1. The total power connected to the electrical appliance can’t be higher than the rated power. 2. Forbid to bind the wire together strictly when using so as to avoid abnormally overheat. 3. Please insert the plug into the jack absolutely. 4 Please place it on where the children can’t reach. 5. Please don’t use it in damp environment. 6. Please don’t remove the back cover presumptuously, contact with us if need service. 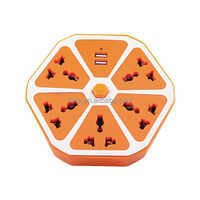 Many kinds of plugs are available. Such as BS plug, European plug ect. Shantou Keta Magnetoeletricity CO., LTD is a manufacturer that specializing in the magnetism electricity and electronic accessories for more than 15 years, covering extension sockets, CD&DVD cases. With a strict product manufacture and quality control system, we can constantly offer satisfactory products to customers. 1) Satisfied quality, Competitive price, Fast delivery, Efficient service. 2) OEM orders are highly welcomed. 3) Customized logos are accepted.